Despite a valiant run chase, Banbury came up just short against Slough in the Home Counties Premier Cricket League. 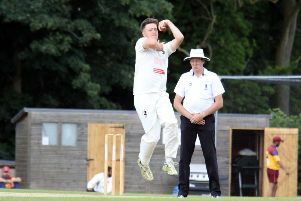 Banbury lost by six runs in Saturday’s division one fixture at White Post Road, where Richard West took three wickets and completed a half-century. 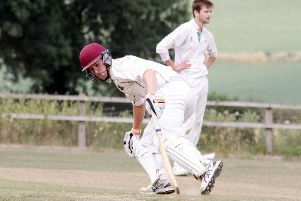 Captain Lloyd Sabin inserted Slough and saw his side again perform well with the ball as they took wickets at regular intervals. Both openers went as Slough were reduced to 4-2, Fahim Qureshi was caught by Shazad Rana for 22 off Olly Wright who also trapped Daniyal Akhtar lbw for 11. Banbury enjoyed more success with the ball but Conrad Louth and Shahid Yousaf picked up the run rate and helped Slough to reach 145-6. Louth made 20 off 55 balls before he was trapped lbw by Steven Green who then had Shahid Yousaf caught behind by Rana for 65 off 95 balls that included six boundaries. But the final few wickets fell without any significant contributions from the incoming batsmen as West mopped up the lower order. Slough were dismissed for 163 runs in the 59th over as West finished with 3-13, Wright took 2-35, Graham Beer took 2-43 and Green picked up 3-31. In reply, Banbury were soon in trouble as they were reduced to 21-3. George Tait was bowled by Ikhlaq Nawaz, fellow opener Craig Haupt was caught by Fasil Noor off Muhammad Haroon who then clean bowled Qaasim Adams. Sabin had reached 16 when he played a loose shot off Nawaz which found the hands of Zaheer Sher. Ollie Clarke and West helped Banbury reach 67-5 before that partnership was ended when Clarke was caught by Sulaiman Akhtar off Ali Akbar Raja for 29 runs from 69 balls which included five boundaries. West kept Banbury in contention, going on to make a fine half-century, but he ran out of partners as only Charlie Hill 17 of the incoming batsmen could make double figures. Banbury still had a chance to win it but the final wicket fell in the 59th over when West was trapped lbw by Sher for 57 runs off 98 balls that included three boundaries.